Article by Doug Chaltry; last updated 9 March 2008. 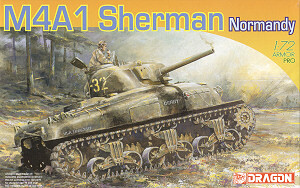 This was one of Dragon's earliest Sherman releases, and until recently, was the only small-hatch M4A1 hull in plastic. Apparently, UM has just released this same kit, though I've not yet seen it in order to make any comparisons. Many people refer to this version as an "intermediate" Sherman, though I still consider it an "early" Sherman due to its 56° small-hatch hull with dry stowage. The reason it's known as an "intermediate" version is because it's had applique armor plates welded to the turret and hull sides, it has no direct-vision slots, and the nose is a single-piece cast housing, instead of the 3-piece bolted nose. 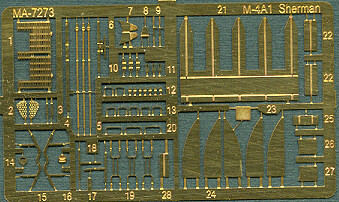 Unlike the hull in Dragon's M4A1 (76)W, this hull scales out correct to 1/72nd, according to the drawings in "Codename Swallow". Like Dragon's other kits, this hull is highly detailed, with fine surface texture, open hatches, a casting mark on the nose, but unfortunately with a closed engine bay and tools molded onto the hull surface. The ventilator and fluid filler caps are sharply molded, and the shape of the hull looks to be spot-on. It would have been nice to have an open engine bay, as the 30-some year old Italeri (ex-ESCI) kit has, but I guess that's asking for too much. 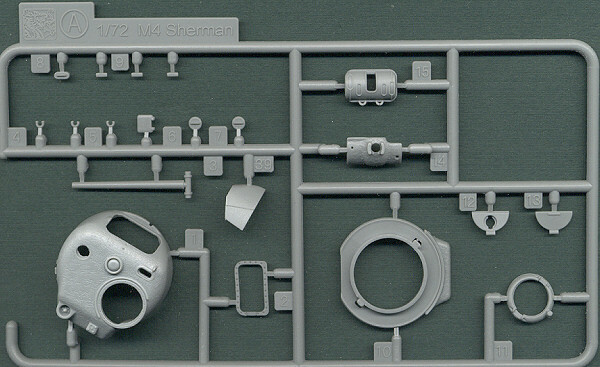 The above sprue is included with all of Dragon's Sherman kits, and includes a plethora of detail parts, many of which will end up in your spare parts box (which is a good thing). All of these parts are perfectly molded. 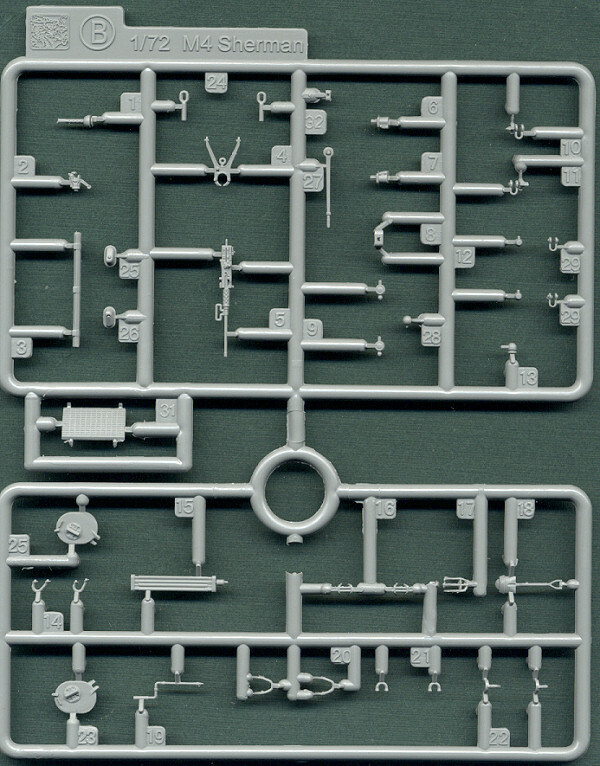 The .50cal MG is the best in this scale, though not all of its parts are on this sprue (hand grips for example), so for this kit where this machinegun was not a standard feature, you don't have all the parts you'll need for use of the MG. The headlight, tail light and periscope brush guards are provided in plastic and are amazingly delicate and well made for such small parts, which demonstrates that there is no technological reason that the pioneer tools could not have been molded separate from the hull as well. In fact, there are a couple included here, such as the shovel, which is extremely well made. Next up is the bogie and wheel sprue. 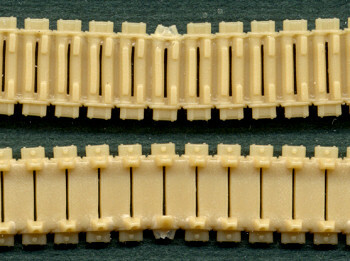 This is the original wheel sprue where there is a flaw on the bogie trucks, which has since been corrected in later Sherman releases from Dragon. If you look closely at the bottom of the bogie truck, you can see where the two wheel suspension arms meet in the middle, whereas this should not be visible, because the front face of the bodie extended a little bit lower than it does on these parts. I have seen where some modelers have corrected the appearance of the bogies by adding a small piece of styrene at the bottom of the bogie to cover the wheel arms, however, this doesn't correct the height of the completed bogie assembly. These incorrect bogies sit about 0.6mm higher than the revised bogies, which may have an effect on the final appearance of the model, if not the length of the tracks as well, though I've not yet built one to confirm this. The return rollers are the raised style (not upswept). The wheels are the stamped, six-spoke variety, and for some ridiculous reason are molded onto the rear suspension arms. All wheels are molded in the same position, regarding spoke and grease plug orientation, which looks quite silly, and surgery will be required if one wants to change the style of wheel used on the model. What an absolutely moronic shortcut for Dragon to take. Aidditional negatives to the bogie trucks include not giving the modeler any options of articulating the wheels, and they have molded-on track return skids. But on the positive side, they are very nicely molded with the casting numbers even molded on the front face. Very cool. The idler and sprocket wheels are very nicely molded as well with sharp details. 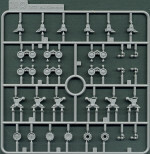 Unlike the revised wheel sprue in later kits, this one includes only one sprocket design: the early style with the cutouts in the sprocket plate behind each tooth. 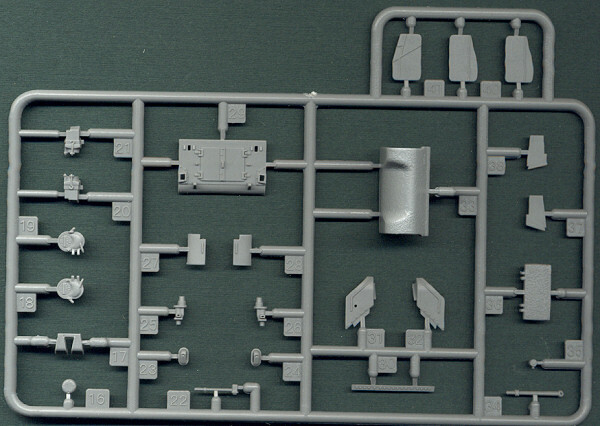 The above sprue gives many miscellaneous details for the hull. The air cleaner boxes are the best ones I've seen, and the front fenders have beveled edges giving the appearance of them being very thin. The final sprue includes the turret parts. The turret is the early version with no loader's hatch. The size and shape of the turret are pretty close to perfect for the scale. Details are exceptionally well-molded, with a separate armored cover for the gunner's periscope, the loader's periscope is rotatable, and the pistol port is molded open with a separate cover. 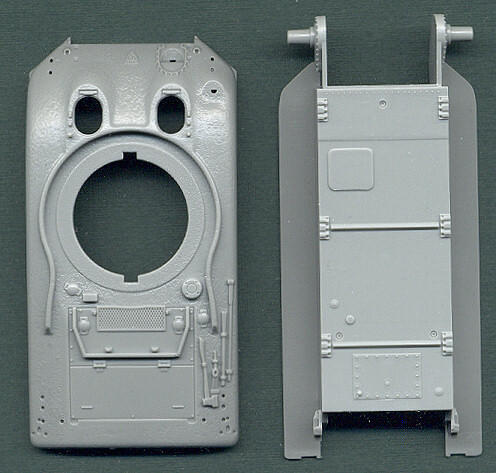 The commander's hatch is open with a detailed inner face of the hatch cover. The gun barrel has an open tip, but I can't measure it for scale until after it's been assembled. 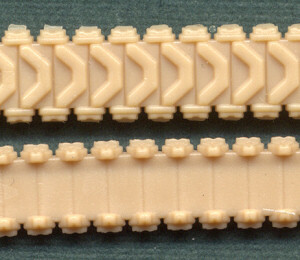 Two styles of tracks are included, the T-48 rubber chevron and T-49 stell bar cleats. The detail is excellent, and even though they are molded in soft plastic, I think that the nature of the Sherman VVSS tracks (being thick and stumpy) lend themselves well to looking good in this medium, so my normal complaint about soft plastic tracks doesn't really apply here. The etched brass parts are pretty much optional, since many of them are also provided in plastic if you prefer to not use the etched parts. But the brush guards in particular will likely look much better using the brass pieces. Half of this fret is taken up with parts for a hedge cutting device that looks very impressive when built. 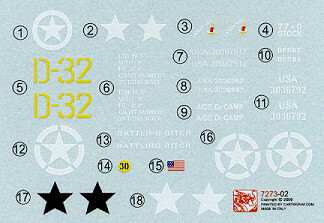 The decals are very nicely printed with sharp edges, opaque ink and good registration. My knowledge of Sherman markings is woefully lacking, so I can't comment on the accuracy of the markings included here, but they certainly look nice.